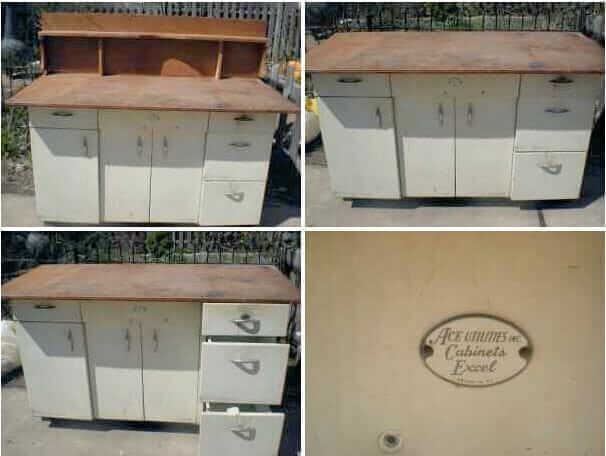 Over on the Forum, 52PostnBeam aka just discovered a new vintage steel kitchen cabinet brand: Ace. We are now well into year #4 of running the Forum — which I think must be the web’s #1 place to buy/sell vintage metal kitchen cabinets. With all this history under our belt, it’s a big day indeed to discover a new brand. Woop dee doo and thank you, 52! Tip: If you have more sink holes of time to waste … I mean, spend … diving into the Retro Renovation world, the Forum can be a very gratifying addiction. The group on the Forum has lots of fun looking at all kinds of vintage kitchens for sale. I can’t even begin to cover all the wonder here on the main blog. Once you register, there’s link that you click each time you log in to see just what’s new since the last time you checked in. Nice. I sent in pictures a year ago, containing a turquise set of Ace cabinets, but not sure they were never posted?? midcenturyman, can you post them directly to the Forum? i get sooooo many emails that i cannot possibly use them all on the main blog. would love to see your aqua aces! I want to see those too! post them in the Ace section. I have friends with steel cabs, but I don’t know the brand. I need to follow up on that!